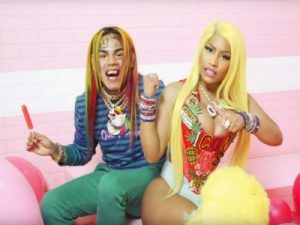 “Fefe” is a song by American rapper 6ix9ine featuring fellow American rapper Nicki Minaj and Canadian record producer Murda Beatz. It was released on July 22, 2018, through TenThousand Projects, LLC. The song was written by Murda Beatz, Cubeatz, Andrew Green, 6ix9ine, and Minaj; and was produced by Murda Beatz and Cubeatz.